Honing oils are normally of relatively low viscosity. 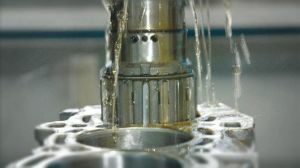 These liquids are used as coolant in cutting operations of fine surfaces, e.g. piston cylinders and knives where high surface finish is required. For this reason the requirements on the cleanness of the coolant are high. Contaminants in the coolant consist of very fine metal chips. Coolant and grits from the grinder flow into a self cleaning return tank of vortex type (VXRT) and are pumped to the Decantor system. In the Decantor system the coolant is clarified from particles in two separate chambers with lamella packages; one with continuous flow and the other settling at periodically motionless liquid volume in the lamella package. The particles settled on the lamella plates settles down to the bottom of the Decantor tank and are removed from the Decantor by a scraper unit to a sludge de-watering unit that consists of a modified standard container and sludge bag (VXDW). Coolant from the de-watering unit is returned to the Decantor and recycled. Purification range: Particles down to 15µ. (Option: down to 3µ).